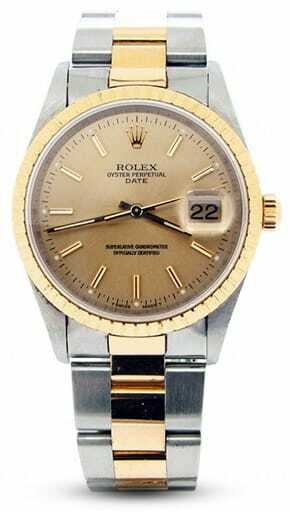 Our collection offers Rolex Date mens watches size 34mm in stainless steel, two tone, yellow gold and gold shell. 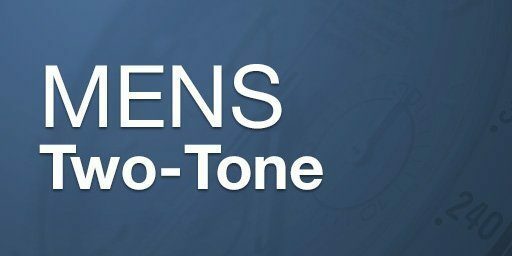 In addition, our selection offers a variety of colorful dials and a variety of bezels and bands. 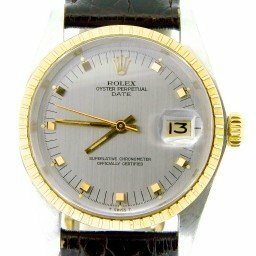 Past leaders from around the world have worn this mens Rolex watch. Clearly, wearing a used Rolex Date on your wrist puts you in distinctive company. 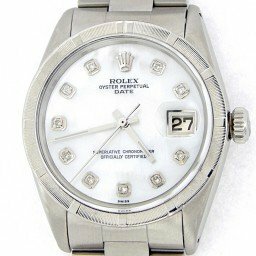 Whether you’re in the market for a Rolex Date mens stainless steel or other model, we have you covered. Keep in mind, we offer our Lifetime TradeUp Guarantee for qualified items. 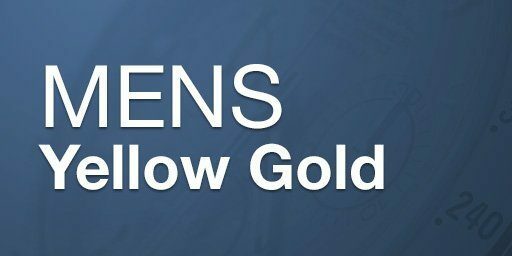 Also, each purchase receives a 30-day money-back guarantee, free U.S. shipping, and available financing. We also offer personalized customer service. So, please let us know if we can help you find that perfect watch. 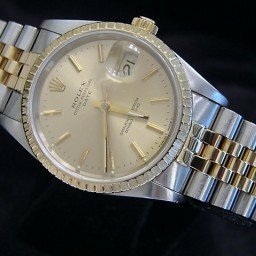 The difference between Rolex Date and Rolex Datejust can be very subtle. 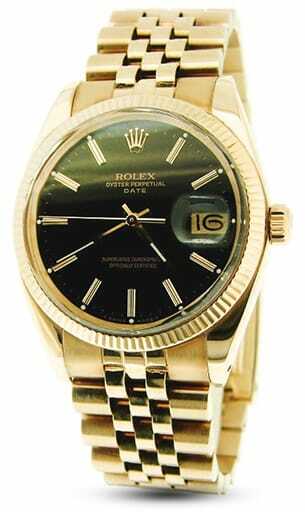 In 1945, Rolex introduced the Datejust, and it continues to be a mainstay in the Rolex line. It is one of the world’s most copied watches. 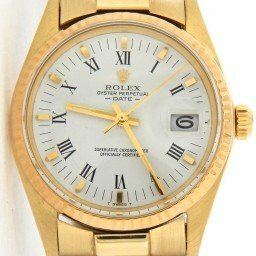 In 1945, the Datejust’s standout features included a cyclops over the date aperture for easier reading. Also, the date wheel progresses precisely at midnight – hence the name Datejust, whereby the date wheel progresses just-in-time. 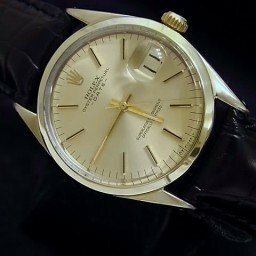 The genesis of the Rolex Date is a bit more obscure, but goes back to at least the late 1950’s. 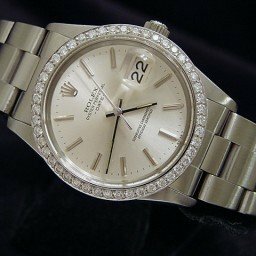 The difference between Rolex Date and Rolex Datejust is also evident within the Oyster Perpetual line. 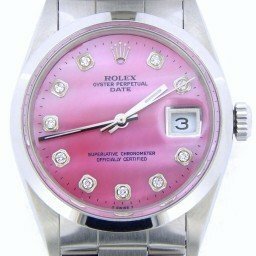 Oyster Perpetual’s model evolution includes the Rolex Date. 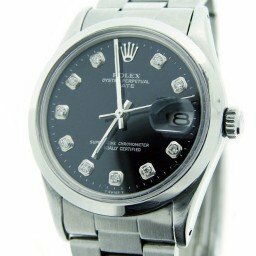 The Oyster Perpetual series pre-dates the Rolex Datejust line. 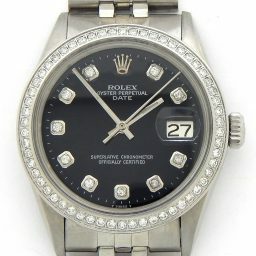 These include the Rolex Air King and the men’s and ladies’ Oyster Perpetual watches. The Oyster Perpetual line varies in size from 28mm to 36mm. In addition, they all exclusively have Oyster bracelets (no Jubilee bracelets) and smaller winding crowns. Chuck Yeager wore an Oyster Perpetual during his historic supersonic flight. 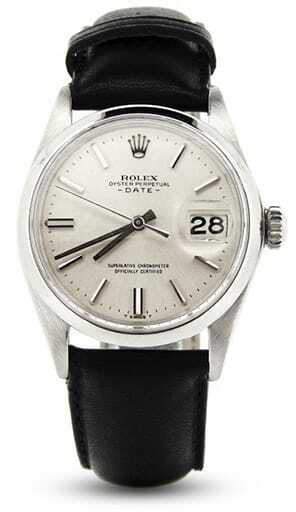 This was considered “the Rolex watch” at the time before the introduction of the Datejust. 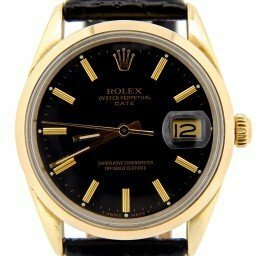 Many Oyster Perpetual watches possessed date wheels, but without the cyclops. 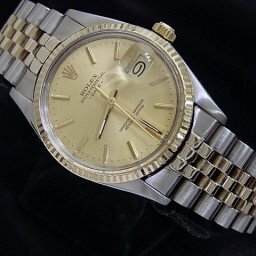 Similar to the Datejust stainless steel line, the Dates have domed or white gold fluted bezels, but no diamonds and no solid gold. 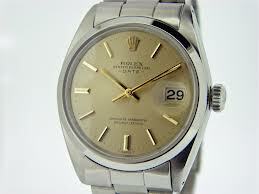 Older Date models exist in two-tone, but not in Rolex’s current line. 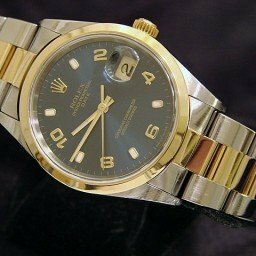 There is another way to view the difference between Rolex Date and Rolex Datejust. 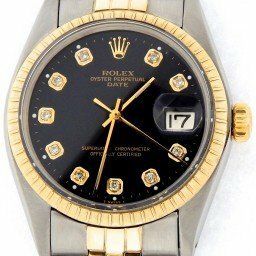 By examining the evolution of the Oyster Perpetual, the Rolex Date is essentially an Oyster Perpetual with a Date and Cyclops. 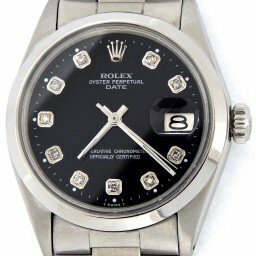 Therefore, they market it separately from the Rolex Datejust. One area of confusion is the setting of the date wheel on the Date model. 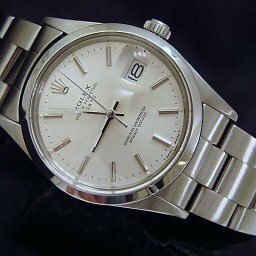 Rolex introduced the QuickSet or “Rapid Date Change” in 1977 whereby the date aperture progresses through the days by turning the crown as the hands are stationary. 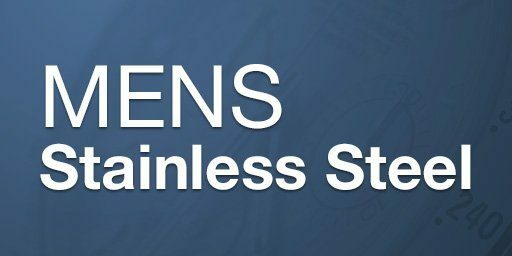 The QuickSet mechanism is found on both current Datejust and Date models. With both models, there is no spinning the hands 24 hours for the date to change. 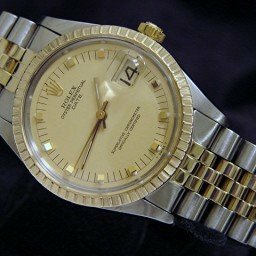 Despite the evolutionary difference between Rolex Date and Rolex Datejust wristwatches, the only distinguishing characteristic between the two is 2mm. 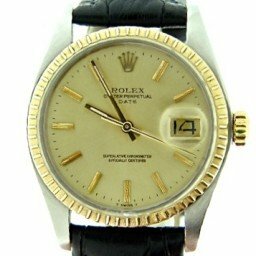 You can browse these luxury models of used Rolex Date watches here at BeckerTime. 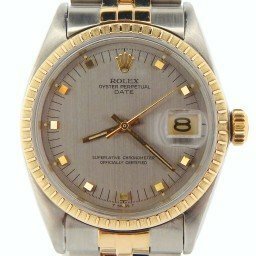 The smaller sibling to the Datejust, the Rolex Date is a great men’s watch for those who like discreetly sized timepieces. Given that the men’s Date watch has been around since the 1950s, there are unsurprisingly plenty of models to choose from. 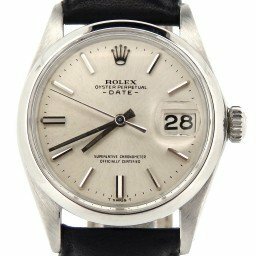 If you’re in the market for a Rolex men’s Date watch, then read on as we break down the many options available so you can pick the right one. 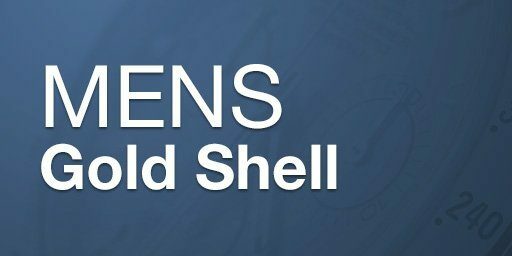 Common design traits of all men’s Date watches, regardless of the era, include a 34mm water resistant Oyster case, a date window at 3 o’clock (naturally, as the name says it all), a Cyclops magnification lens on the crystal, and an automatic movement powering the watch. 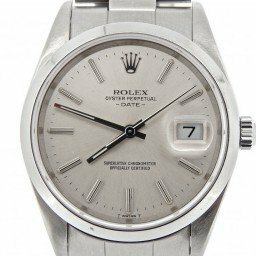 While Rolex currently only offers the Date 34 watch in full stainless steel or in stainless steel with an 18k white gold bezel, browsing the secondary market for discontinued models offers a much wider choice. 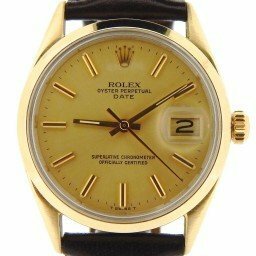 In addition to stainless steel, there are also men’s Date watches in two-tone steel and yellow gold, yellow gold shell, and even full yellow gold. Bezel options include domed, fluted, and engine turned, along with after-market custom diamond-set ones. You can also choose between a sporty Oyster or a dressy Jubilee bracelets, or wear it with a custom leather strap for a classic dapper look. 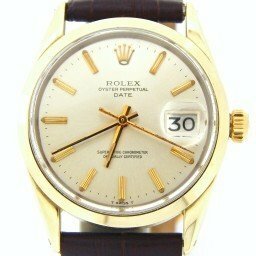 As expected, the Rolex has updated the men’s Date watch collection over its six-decade history. 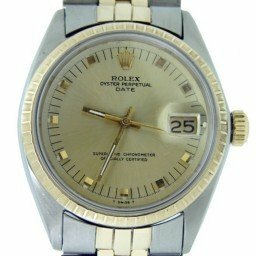 So when you’re picking your ideal men’s Date watch, consider the key features of different generations of this Rolex model. 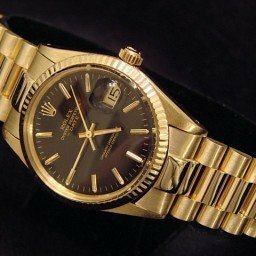 Rolex produced the men’s Date ref. 15xx family from the 1960s until the early 1980s. 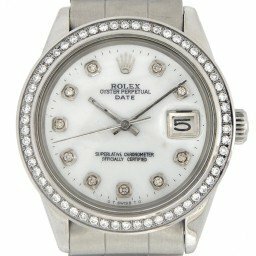 As with most vintage Rolex watches, these particular models include acrylic crystals on top of their cases and non-quickset movements. 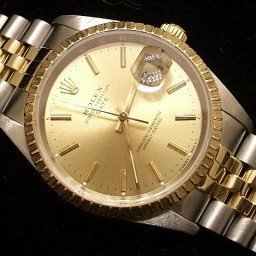 Non-quickset Rolex watches means that in order to change the date, the wearer has to continuously turn the center hands around midnight until the right number appears in the window. 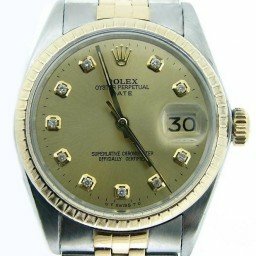 The following lineup of men’s Date Rolex watches came in 1989 and carried the 152xx reference numbers. 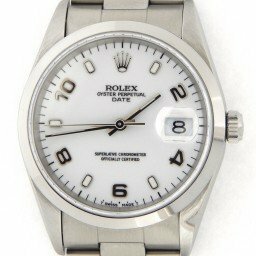 In addition to the inclusion of scratch-resistant sapphire crystal, these men’s Date watches are powered by the updated Rolex Caliber 3135 movement with enhanced durability and precision. 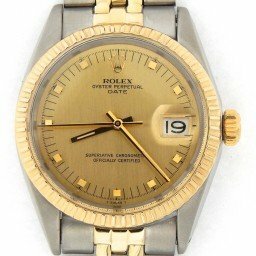 Finally, in the mid-2000s, Rolex presented the current ref. 1152xx with a slightly broader case and thicker lugs (but still the same 34mm size) and an enhanced bracelet with polished center links and an updated clasp.  As previously mentioned, there are only stainless steel models available from this current men’s Date collection. 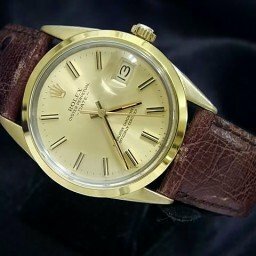 Which Rolex Men’s Date Watch will it be? 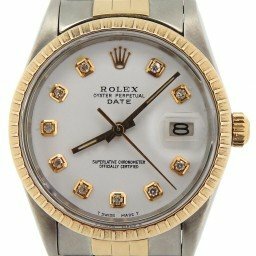 Pricewise, you can find a men’s Date watch for as low as $2,300 for older models to just under $10,000 for a full yellow gold version with custom diamonds. 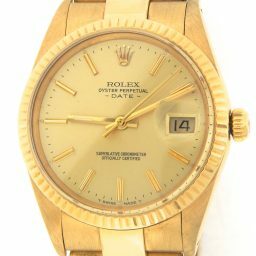 While the range of men’s Date Rolex watches is wide, determining what traits are most important to you—whether it’s the material, the movement, the bezel, the budget, or the era—will help you narrow down the choices. 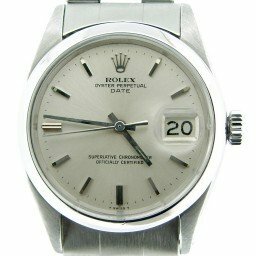 Regardless of which one you ultimately decide on, this is one men’s Rolex watch that illustrates that good things can indeed come in small(er) packages.